It’s that time of year: we are excited to reveal this year’s MEGA Bag! I hope you’re ready to throw it back to 1979 to celebrate FUGE’s 40th summer. You can secure yours by pre-ordering any time between now and May 27. 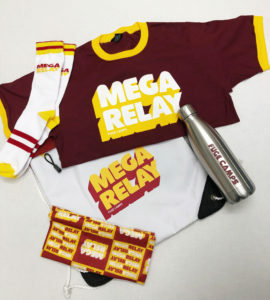 In your MEGA Bag, you’ll find everything you need for Mega Relay bundled together for one low price. Contents include a t-shirt, water bottle, buff, socks, and the bag to hold it all. The theme for this summer’s Mega Relay is “1970s Retro” so come decked out in your funkiest, grooviest threads. This MEGA bag can be yours for one low price of $35, a savings of $12. You can’t beat this funky deal and you’ll be ready to hit the MEGA Relay field to the max. In addition to the MEGA Bag, for the third year in a row, you can also pre-order a camp store card. Parents can order in increments of $10, $25, or $50 for their kids to spend in the FUGE Store. NOTE: These camp store cards are only good in the camp store, not for any other stores at your camp location. Any unused amount can go towards the missions offering to support IMB, NAMB, and our local ministries we serve through MFuge. Far out! To ensure we get everyone the camp store cards and MEGA Bags they need this summer, we are asking you to pre-order them now. With pre-orders, we can guarantee upon your arrival at camp that we will have the number of camp store cards and MEGA Bags requested. Don’t wait though! Group Leaders must pre-order by May 27, 2018! After May 27, MEGA Bags and camp store cards will only be available upon arrival at camp on a first-come, first-served basis, while supplies last. Parents, you can find an order form by downloading our Parent Pack. Just remember to turn it in to your group leader before May 27. Feel free to email us at fuge@lifeway.com with any questions! See you groovy people on the field. Peace. Can you dig it? Our church is not ordering mega bags this year and my daughter really wants one. Can I order one through you directly? We are excited to be a part of a team that creates resources that help people walk closer with Jesus Christ. Learn how Bible Studies for Life helps churches intentionally disciple people every day at biblestudiesforlife.com. THE FUGE PACK (formerly known as the MEGA Bag) IS HERE! Check it out! Group Leaders: Pre-order now for a $15 savings! Bags will be reserved and ready for pickup at camp. Orders must be completed by the Group Leader by May 26 deadline. Order now!